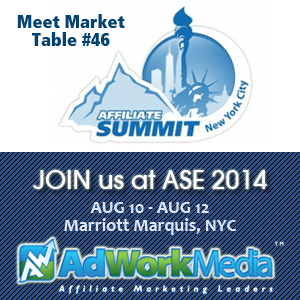 AdWork Media is proud to attend this year’s Affiliate Summit East 2014, hosted at the New York City Marriott Marquis, Aug. 10 – Aug. 12. Affiliate Summit is the premier conference for the Affiliate Marketing industry and is completely sold out. If you happen to be attending this event please contact us to arrange a meeting or a quick greet with the AdWork Media team. Visit us at the Meet Market on Aug. 10, Table #46. Attendees get a chance to win $500 and more prizes! We hope you had a great time at ASE14. Thank you for coming and we look forward to another great show in Vegas for ASW15. Thanks, we had a great time at ASE as always!